Barrel: 4150V Chrome Moly steel, nitride treated for durability. 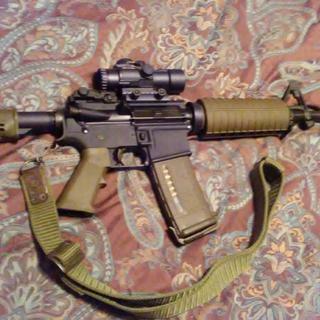 Chambered in 5.56 NATO, with a 1:7 twist, M4 barrel extension, and a carbine-length gas system. 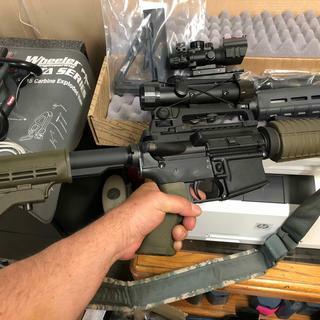 The barrel is finished off with a standard carbine olive drab green handguard, F-Marked gas sight base, and A2 flash hider. Bolt: Full-auto profile bolt carrier group. Milspec Carpenter No. 158® steel bolt. Gas Key Hardened to USGI Specifications, Fastened with Grade 8 screws, and Staked Per Mil-Spec. 8620 steel M-16 profile carrier is chrome lined and phosphate coated. 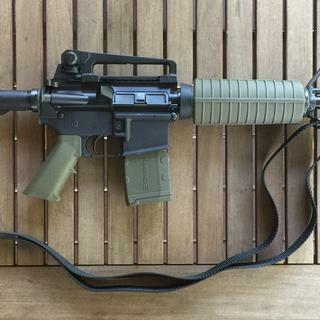 Lower Build Kit: Includes Classic Olive Drab Green M4-Style Stock, Olive Drab Green A2 Pistol grip, Classic Lower Parts Kit and Mil-Spec diameter 6-position buffer tube assembly. Everything you need to finish your stripped lower. Can it be shipped to New York? BEST ANSWER: Can a kit be shipped to calihellnia as of 2019? Can I get a 1:8 or 1:9 barrel for the olive drab kit? BEST ANSWER: As of right now, PSA does not offer this kit with any other barrel twist rate than 1:7. PSA has the FREEDOM Stainless mid-length upper in a 1:8 twist. Mid-length cycle very smooth. I have a friend and he was wondering if it can this be shipped to California home address? BEST ANSWER: As of 6/18/18 when mine arrived it can still be shipped to 'KALIFORNISTAN'. Can this be purchased on-line and picked up at PSA? BEST ANSWER: This can be purchased on line and sent directly to your home, you'll need a stripped lower and that'll need to be sent to your FFL. This kit will work with any A-R lower. Even the 80% Lowers you finish your self with a jig. A friend even poored his own aluminum, self made sand form. Then tried it on more than one A-R.!! Wouldn't you know it,!! This kit is one of the A-R's building kits, that he put it on" and everything was flawless.!! Regardless what you do with it, the question is whether it can be bought online and picked up at PSA storefront, not what uses can it have. If you don't want to pay shipping or wait, you can probably make arrangements to pick up at one of the locations. PSA has awesome customer assistance. Can this be shipped to the fine state of Maryland? Does it come with upper and lower receiver group? BEST ANSWER: The only part that this kit is missing is the Lower receiver. What type of adapter will i need to add a vertical hand grip? BEST ANSWER: There are rail sections specifically made to fasten to the poly handguards. That will give you a place to attach a vfg or bipod. You will probably have to replace the hand guard with a different one, if you want to add attachments. I'm not aware of anyone who makes an adapter for adding attachments to the standard hand guard. Didn't know that. Thanks Daniel! 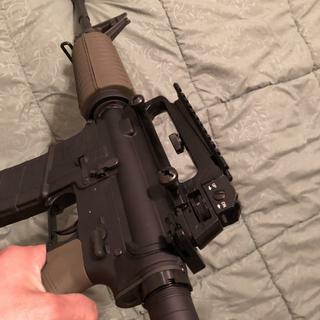 I replaced my hand guard with a Promag quad rail and have been able to add lots of great attachments including vertical foregrip. BEST ANSWER: Whats that now? What else will be needed to complete this build? Magazine and ? You will need a rear sight to complete the build with this kit. Other than that you will be range ready. Lower receiver. Last I looked PSA had them on sale at a great price. 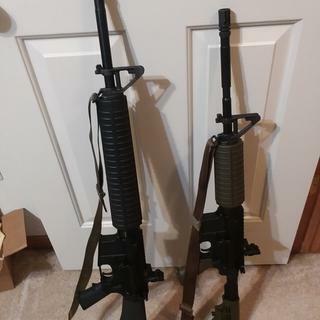 I just bought 2 for other builds. Excellent quality. Just a stripped lower receiver. This kit is very good, so don't get any lower, not a high end either, but a good one. Besides mag, you will need a lower receiver. Also sights or optics. Only thing you need is a magazine and basic hand tools! First time buyer, is everything included in kit so once built be ready to fire or do I have to purchase anything else? No, you will need to purchase a stripped lower and a rear sight or optic. No rear sight or optic required for the build to become a functional rifle, only a lower receiver. Optics provide rifle accuracy, not functionality. They are transferred by an FFL, not registered. You will have to purchase a rear sight or go with an optic. I installed a Troy fixed rear battle sight on mine and it worked good with the A2 front sight. The only issue I have with this rifle is the battle sight adjustment is off to the right a noticeable amount making me think the alignment on all the parts in the upper receiver assembly may no be dead on. Lower receiver is needed for functionality, not optics. Optics provide accuracy, not functionality. You are correct, a lower has to be purchased as it isn't included in this kit. I assumed a person shopping for a kit on the internet would already know this. You also will need a lower receiver. You will have all the parts for the lower so all you need is a lower receiver and then you put the parts you have in it from this kit.. It is a great experience and you can learn how the ar 15 operates. You will also need optics either iron sites or a red dot/scope. Yes other than the lower serialized piece. I would recommend buying some gun oil to give it a good cleaning before your first firing.... Great gun, bought this kit 2 months ago! You need stripped lower and assuming you’ve got all the tools you need to complete the build. You will need to purchase a stripped lower. Just need a lower receiver. Everything else is there. Since this does not have a rail system, I was wondering what type of foregrip can be fitted to this rifle? BEST ANSWER: Any two piece carbine length rail system should fit. If you opt for 'FREE FLOATING' you will have to remove front sight gas block. magpull's MOE rail sections are an easy way to mount bipods, lights and grips. Can this still ship this kit to California as of April 2019 ? Are these California legal ? can this be shipped to connecticut? Do I need a stripped lower as well, and does it require an ffl? You'll need a stripped lower ( Sold Separate ) FFL Required. This kit, as sold, DOES NOT require an FFL. Yes, you will need a lower. The kit will be sent to your house. Lower sent to FFL. You will need a stripped lower. That does require FFL. Yes, you will need to purchase a stripped lower lower receiver as well. Purchasing the rifle build kit does not requiring using an FFL to facilitate the transfer. However, you will need to use an FFL to facilitate purchasing a stripped AR15 lower. You will need to have a stripped lower to complete this build. If you purchase a stripped lower it will require an ffl to ship, however, the upper build kit that is pictured here does NOT require an ffl to ship. Yes you will need a stripped lower and you will need to purchase the lower at a gun store or have it sent to the gun store. Just like purchasing a rifle you will need to do paperwork. You need a stripped lower for this kit. The kit does not require an FFL and can be shipped directly to your house. However your stripped lower will require an FFL. You need an FFL to ship your lower receiver, that is where your serial number is, for that reason it is considered a weapon. No FFL required, you do need a stripped lower or an %80 lower if you have the know how. The %80 does not need an FFL. Yes a stripped Lower is needed and it does require an FFL for the lower. Thanks for the question I hope this helps. You will need a stripped lower, and that will require FFL. This kit is mailed directly to your doorstep. This is a semi-automatic rifle, correct? Yes. It will eject the casing of the fired round and load the next round in the magazine each time you squeeze the trigger. Semi-automatic rifle KIT. Yes. However, you will still need a lower receiver to complete the assembly. Yeah it’s semi automatic it’s illegal to own a fully automatic rifle. Yes, and it works just fine. Has the head space been checked on the upper? BEST ANSWER: I have never checked the head spacing. I didn't think it would be necessary because the upper was completely assembled at time of purchase. I have not had any issues when firing the gun to consider checking the head space. It fires as it should with no issues what so ever. Feeds and ejects every brand of 5.56 ammo as well as my reloads. It is part of assembly. Nobody builds uppers without verifying the head spacing. This one fires flawlessly even with steel casings. More than I can say for my Aero costing 3 times as much. Great value here. I didn't check it, but it functions fine with no signs of head space problems. Does this have the heat shields in the hand guards? BEST ANSWER: They work just fine, I’ve put a few hundred rounds through the Gun in about a minute and still had no problem with heat. There are thin strips of aluminum in the hand guard that act as heat shields. Yes it does have the heat shields. 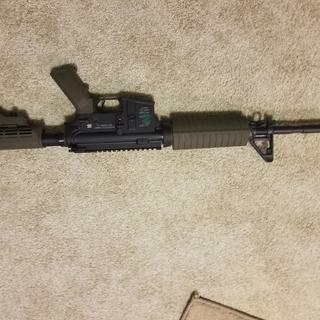 My first build, any recommendations on sights? BEST ANSWER: My local Gun Shop has the way AIM brand removable carry handle for 19 bucks .They are well worth the money in my opinion. You can take it off and install a scope or reddot later if you choose to. Hey Matt if you get the MBUS flip up rear sight you should be good to go. That upper with your build kit has that fixed front post so you just need the rear. And then throw a Red dot on and you'll be set bro. Thank you so much. Went with the MBUS flip up rear sight and Vortex Strikeforce II red dot. Appreciate the guidance!! We installed a fold-down rear sight on the rearmost slot on the rail and a holosun circle-dot sight mid rail. With the A2 front sight combo works great. PSA's A3 detachable carry handle or magpull's simple MOE rear backup sight. I know the barrel is 4150v Chrome Moly steel , but is the barrel mil-spec ? 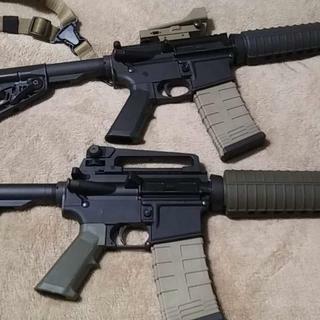 BEST ANSWER: I believe all military M4s have chrome lined barrel and chamber. In a semi-auto, this will make little difference. The original M16s did not have chrome either. Physical dimensions are mil-spec. These are a great bargain and all you need to complete the weapon is a lower receiver. The barrels are goos quality CMV (chromoly steel), but not chrome lined unless specifically declared so. Chrome lining is a barrel upgrade, and not on the economical builds. Next level is the more expensive Cold Hammer Forged (CHF) rifling me This used on top tier barrels. These CMV barrwls are great for the price point, but not chrome lined or CHF. I have talked to one of the guys at Palmetto. They said that it is built to mil spec. Is the barrel phosphate? Is the bore chrome lined? BEST ANSWER: This is a Nitrided barrel, inside and out. There is no chrome lining on this barrel. Hey Daniel, once assembled you definitely are able to fire once built. Just remember, you are missing the lower in order to complete the rifle. 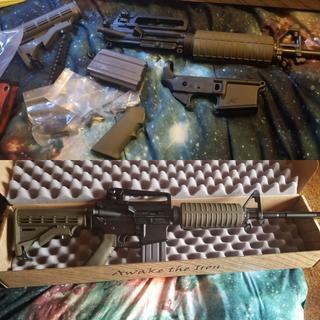 I have not ordered that specific AR, but I've ordered others similar and they do not come with instructions. Although, you can YouTube it. That's how I built mine. Good luck! Yes, the barrel is chrome lined, just the exterior is phosphate. Hey guys. This would be my first time owning an AR. Is this kit able to fire once assembled and does it include instructions? BEST ANSWER: See the other similar questions. You will need a Stripped Lower Reciever and rear sight or optic. It does not have directions. However, you can bing or google how to assemble a stripped lower receiver and see many good videos on how to put it together. You will need a punch set and other tools to make it easier. What is the usual (other than the 15 day process) processing time in getting this shipped out - on average? Does this Rifle come assembled. ???? BEST ANSWER: No. The upper is assembled. The lower isn't due to kit doesn't come with a lower. You have to supply your own lower, that you can purchase separate. No, the upper is ready to go, but you will need a stripped lower. All part shown will make a complete lower assembly. Once someone assembles it. It comes as shown. The upper receiver has already been assembled and all the lower parts are disassembled and missing a lower receiver. The upper does but you have to buy a stripped lower and put the parts together that come with the kit. You tube can show you how. The upper is assembled fully but the lower is a parts kit that will need to be assembled on to a stripped lower. The lower assemblies Not Included. The trigger assembly needs to be inserted and then it's a complete rifle. 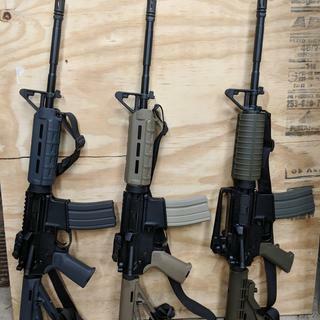 No, complete upper, lower build kit. Take about 30 to 45 min. To assemble YouTube has some good video on it. The top end is assembled, but you'd supply your own lower receiver and install the lower parts kit. The upper comes assembled,you will need a stripped lower receiver to assemble the lower build kit. Just the upper, you'll need to buy the lower separate and assemble it. No that’s why it’s 299.00. You also have to buy a stripped lower. Just was curious how it came in the box. Does this include a rear site? BEST ANSWER: No it doesn't. I installed a Troy fixed battle sight. Most rear sights you purchase will work. Double check the description of the sight you"re interested in to make sure it works with an A2 front sight. It does not, you should take the chance to grab a PSA charging handle to complete the retro look. It does not include a rear sight. But I was very satisfied with quality of kit regardless. No. You will need to buy whatever rear back up site or optic you prefer. This is a great build kit, but it does NOT come with a rear sight. Hello to answer your question...no it does not have rear sights. No. There is no rear sight and no magazine. no it does not but it is a nice kit. 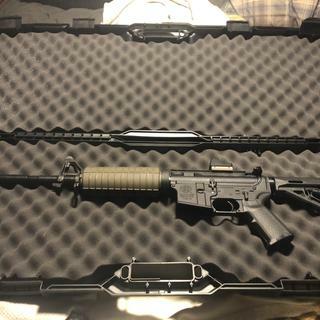 Is this all a need complete set for this AR? It has every part needed to build the rifle, except for the serial-numbered luwer receiver, a rear sight an a magazine. You will also need to purchase a lower receiver and a rear sight to complete a build. Yes, EXCEPT for the lower receiver. You’ll still need to buy a lower separately. Just add your stripped lower, and a rear sight or optics and head to the range. Yes, the kit is complete. All you need is a few tools. you need a stripped lower. get one at your local FFL. Does it come with "Sling" adapters....?? It comes with rectangular loops for a GI style sling. They won't work with QD studs, if that's what you're asking. Yes. 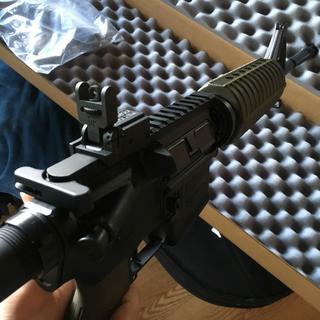 It comes with the standard M4 sling mounts. What lower is recommended? first build. BEST ANSWER: Any mil spec. PSA makes great parts including lowers, i bought this same kit for an Anderson lower I had. My first experience with palmetto. The Anderson lower worked perfectly with the PSA rifle kit. I just bought a palmetto AR10 lower and it’s real nice. I will be buying more from PSA. For the price you really can’t get better. I have used 2 different lowers in my builds (3). PSA makes as good a lower as any in the budget build department. No need to spend more. PSA-15 is always the best fit but I have used Anderson mfg. Also and they turn out nice. Any mil-spec AR15 lower will work. Have fun with your build, and good luck! ANY. POVERTY PONY IS GREAT ! THAT'D BE AN ANDERSON ! Any 5.56 lower will do. This was my first AR build and wasn’t all that sure about it. I checked out quite a few suppliers and decided to use PSA after watching numerous reviews and melt down videos. I chose the 16” carbine rifle kit on the daily deals and just picked up a stripped lower at my local gun shop. 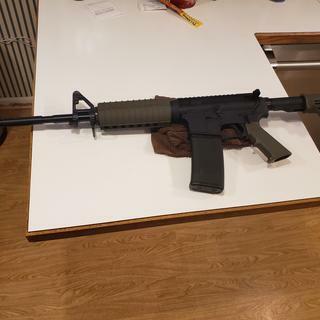 I found an easy to follow on line build instructions and in about 45 minutes I had assembled my first AR15. It’s that easy. Order one —build it — you will be pleased. 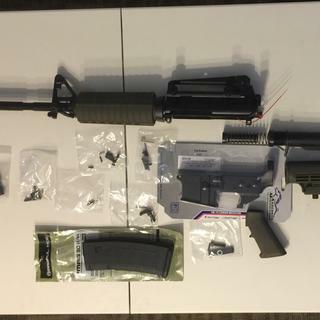 For the price, and the quality of this rifle kit, a search would be long journey. One of grandsons and I had it assembled and functioning in few hours. We had mounted a red dot and sighted it in the next day. Great rifle. Had never had a malfunction in any of my psa rifles. Can't beat the price. Everything fit together perfectly and all the parts were there. I would recommend this setup to anyone, great kit! Put it together and the accuracy is phenomenal for the price you pay. I recommend this kit to anyone wanting a great starter rifle. Really enjoy this rifle, so i got this second build kit. Great Quality Workmanship and Packing!!! I ordered this 3/17/19 and received it with other items on 4/3/19. It was 11 BUSINESS days and I was impressed by the quality of all the items! It was well worth it! Already have it all assembled with an Anderson lower. Just pay attention when you install the buffer tube NOT to screw it too far into the receiver as you will have difficulty putting the upper on. I stopped at that point to make sure before dimbling the receiver end play that the upper would attach without force or filing metal as others I've read have done. It was really super easy to fit it all together! Thank you Palmetto!!!! Everything went together well and it performed great. Affordable and accurate pew pew! Very pleased with my new Rifle. I used an Anderson lower. Only issue was in the assembly where I ran into a poorly machined trigger kit. The retaining pin would not seat and the trigger would stick. Luckily I had another laying around from a previous build to finish throwing it together. Awesome budget rifle and I’m sure if I addressed PSA they would send me replacement parts without question. Enjoying the olive drab green as it stands out from the norm! 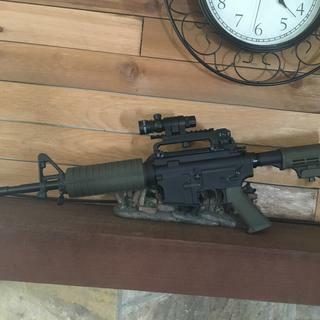 Would like to add the Sig Sauer red dot sight but looks great as is. The kit arrived in less than a week. I bought the stripped lower, mag and sling locally. 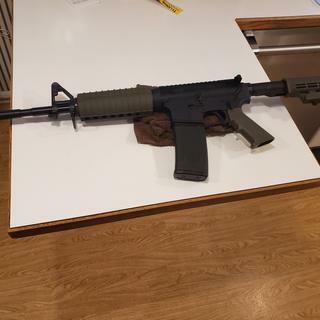 I had a spare carry handle assembly. Easy to assemble, the upper mated perfectly to the lower. I have fired a few hundred flawless rounds through it. 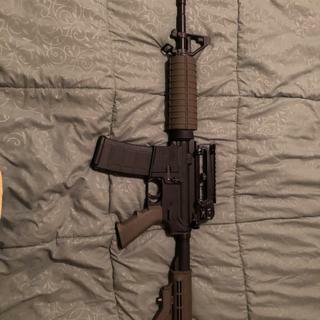 Nearly 1/3 the price of my Bushmaster with equal performance and quality. Excellent kit. I did not have to file or sand anything. Installed kit in 20 mins. Fired 220 rounds without a problem. Best kit for the money! Fast delivery too! Old school style with modern reliability! Great kit for the money! You can't beat this kit for looks or performance. The only thing I changed was heavy buffer and BCM heavy extractor spring. Also put an old school carry handle to complete the look. Put 100 rounds or so and perfect. 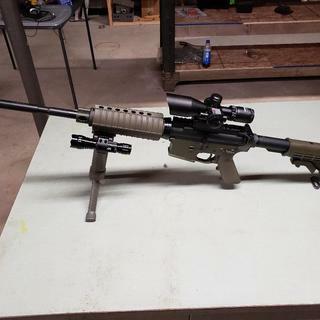 Very very nice rifle for price. Really can't beat it. Solid barrel. Shoots strait as hell. All there, except the stripped lower. Fun to build. Shoots good. Looks good. Fun to shoot. Seems nice for the price. Always wanted one. Now I have one. Thank you for the very quick shipping. This upper kit was easy to assemble in a couple hours, which was pretty good, considering it was my first build. Put it on a PSA complete lower and fired it up. Everything worked perfectly. 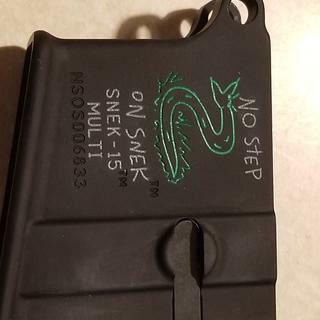 I ordered the M4 carbine kit and the snek stripped lower. 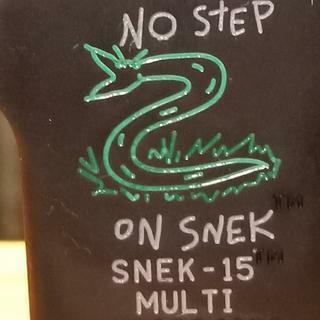 I received the snek quickly and got it backfilled. I got the rifle kit in 6 business days. 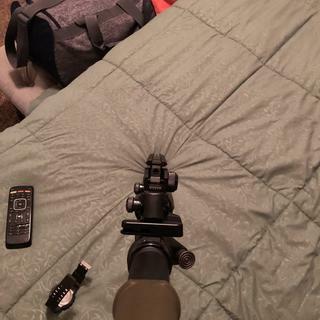 I assembled rifle and it's ready to go do some shootin. 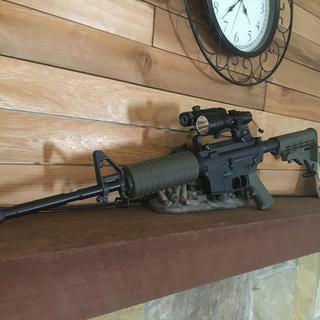 This is my first ar 15, simple to put together. I am very pleased the the entire transaction! This rifle kit is easy to assemble on a lower and use. My third build from the folks at PSA and I can't speak highly enough of the standard. Easy to put together, and it shoots well. Winner winner chicken dinner, no way I could pass this up ! $259.99 free shipping! what a steal! At this price i couldn't pass this deal up. Great kit and the ODG added a nice touch to the rifle. Great kit at a great price..dont pass it up. Another great build, great quality at a great price. I picked it up when they had the shot show sale. Once again I'm disappointed about the little things,its the 2nd awesome kit with no PSA stickers. A great looking basic rifle! 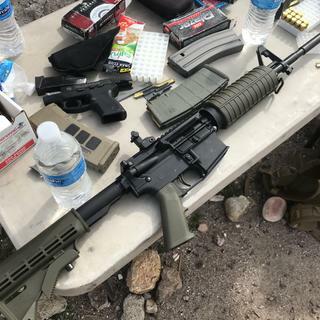 It would be hard to find a better basic AR kit for the price. Good parts for the price! Everything that matters is right. Parts and pieces fit together nice, m4 feed ramps in upper, bcg staked proper, fsb straight not canted. Comes with standard mil spec trigger, and a2 furniture. You can always swap out that stuff later if you like, but for the price I won’t complain. Palmetto sells good parts and kits. Shoots good. All you need is a lower receiver, and a rear sight or optic. Bought this for a Dad and Daughter 80% build, walked her through each step then went to the range. Shot flawlessly with no issues! She absolutely loves it!!! Great fit and easy to build. 20 inch and 16 inch each work great. Fast delivery price was good , best thing I've done on a long time. Good fit easy build , each the 20 inch and 16 inch work perfect. What a good purchase. As a purchaser of chf kits and a nitride upper I really like I was intrigued at the prospect of a more entry level kit. I expected the result to be a functional and reasonably accurate rifle, it is. What I didn’t expect was a level of machining and finish of the lower parts kit and bcg that equaled or exceeded the more expensive offerings. I am impressed ,and just being practical here this would be a fine one and only rifle . So glad PSA is putting out this level of quality for a very reasonable price allowing me to indulge a variety of tastes in ARs. Not sure you can beat these prices. I’ve ordered a lot of equipment and ammo from PSA and never an issue with any of it. I've dealt with Palmetto State Armory before. They have been nothing but a First Class Act for as long as I can remember. I've been collecting guns for over 20 years and they are the best bang-for-the-buck without question! With Vortex Spitfire 3x prism scope. This was my first kit and I cannot praise it enough. Assembly was standard, all the parts were included with a couple extra springs and everything fit as expected. Sighting it was a breeze. I only sent a 50 rounds through it so far, but it worked flawlessly. For a starter kit, you can't beat this one. 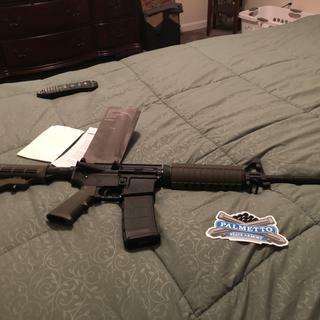 I've bought from Ceratec, Brownells, and various others... but Palmetto is always the best. Great gun! Worth every penny. Super great kit and price! Everything went well with the Anderson receiver. Haven't finished the build with any customization, or optics, yet, but like the other 5 builds from PSA, I'm sure it will be sweet.